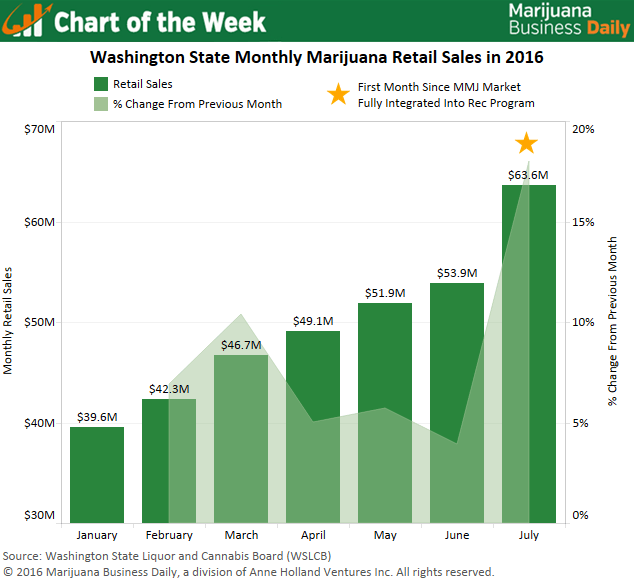 The merger of Washington State’s unregulated medical marijuana industry into its recreational cannabis program has led to a huge spike in monthly sales for licensed retailers, indicating that the complicated transition is playing out as hoped. In July, cannabis retailers posted an 18% spike in sales from the previous month, a new record for the regulated market. The $63.6 million in sales marked an increase of more than $10 million over the total in June. The sizable gain comes on the heels of a July 1 deadline for all remaining unlicensed dispensaries that had not won permits under the rec program to close. After legalizing adult-use cannabis in 2012, Washington decided to fold its unregulated medical marijuana market into the rec framework. The plan involved boosting the number of recreational retail licenses to give a fair share of existing dispensaries a chance to win permits, allowing them to either operate solely as adult-use stores or obtain a “medical marijuana endorsement.” The endorsement allows them to sell to registered medical marijuana patients, who must pay the 37% excise tax assessed on marijuana transactions but aren’t subject to the 9.6% state sales tax that recreational customers must also pay. At one point early this year, Washington was home to an estimated 800-1,200 unregulated and unlicensed dispensaries serving a patient base estimated at between 100,000 and 125,000. There are currently 413 licensed retail stores in the state, 362 of which have received a medical endorsement. This change has fundamentally altered the state’s retail landscape, forcing hundreds of dispensaries out of business and shaking up how patients get their medicine but also bringing the MMJ industry into a regulated system. Judging by July’s historically high sales figures, it seems many of these patients have moved to a rec store – either with or without a medical endorsement. To receive a medical endorsement, retailers are required to have at least one certified medical marijuana consultant on-staff – a process that requires an employee to take and pass a Department of Health-approved training course – as well as a dedicated portion of the store where they can issue medical cards to patients. This has left some dispensaries wondering whether it’s advantageous to jump through the hurdles necessary to receive a medical endorsement, and patients deciding if a 9.6% savings is worth putting their name in a state-run database. Chad Champagne, owner of 420 Carpenter in Lacey and 420 West in Olympia, saw a collective 26% jump in sales from June to July, and he expects growth to increase going forward. He believes medical clientele who are choosing to purchase from the recreational market are driving the increase in sales, due to his store’s aggressive pricing model and patients’ apprehension about signing up for the state registry. In Champagne’s view, acquiring a medical endorsement is valuable in the short term because it ingratiates the store to the large customer base currently looking for a new home, though in the long run it may have diminished value as patients settle into their favorite store. Ramsey Hamide, owner of Main Street Marijuana in Vancouver, is taking a wait-and-see approach. His store is located in Clark County, an area of the state that did not have a large number of dispensaries to begin with. Main Street Marijuana has seen a slight increase in month-over-month sales, though the growth is similar to what the store saw last year, indicating a seasonal trend rather than a boost stemming from ex-dispensary customers. Hamide does not view the medical endorsement requirements as too costly or burdensome, but perhaps not worth the effort to serve a small percentage of customers looking for MMJ services and products. While the effects of Washington’s new law are still shaking out throughout the state, many patients – whether they identify as such or not – are being thrust into the rec market, and retailers would do well to identify and cater to their unique set of needs. Those numbers don’t look right. I can’t seem to find them anywhere on the WSLCB site. They are there (in 2 places currently). The numbers do not correct for the different number of days in the 2 months. The per-day retail sales growth was closer to 14%. Month-to-date, August is about 5% above July in daily retail sales. Patients are experimenting with a system that does not, for the most part, seem to be meeting their needs. Is this “market development” for the law enforcement community?